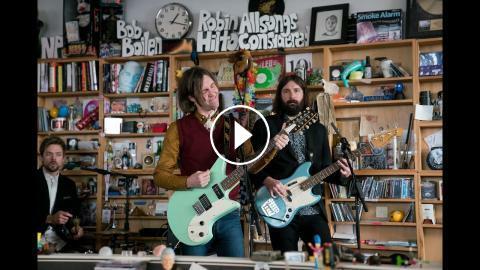 Jan. 15, 2019 | Bob Boilen -- Aaron Lee Tasjan arrived at the Tiny Desk in his fashionable ascot and mustard-colored shirt, sporting reflective, red, rounded sunglasses and mutton chops. As he warmed up, the sound of the middle-and-late 1960s came through his seagreen, Gorsuch 12-string guitar while his voice felt both familiar and fresh. This buoyant, East Nashville-via-Ohio soul and his fabulous band have a knack for channeling Paul McCartney, Tom Petty and The Kinks. Aaron Lee Tasjan's love for this older sound infuses Karma For Cheap, his recent album, with an optimistic THC-veiled sentiment — one that can be heard on "Songbird," his opening number here at the Tiny Desk. 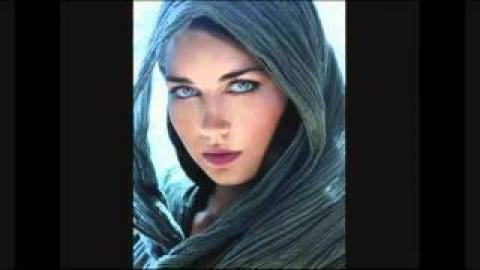 "There's a songbird singing, I'm laying on the floor. Something feels right that has never felt right before." These are songs of encouragement, and the final tune in this Tiny set, "Set You Free," invokes that sentiment in plain-spoken language: "You gotta change your mind, you gotta plant the seed and let it set you free." All the while, drummer Seth Earnest, guitarist Brian Wright and bassist Tommy Scifres seemingly channeled their love of David Bowie's 1972 song, "The Jean Genie" (a song mixed in Nashville), in its rhythms and vibes. It's all in good fun, exploring the ages and traversing music history. Aaron Lee Tasjan has a knack for making music that is timeless, as good music wants to do.